The undisputed leader in the used car business – Carmax, has capabilities in vehicle acquisition that the average dealer does not. It’s highly profitable wholesale business is held upright by more than 200 locations across the US, an infrastructure not plausible for the average dealership or group. Needless to say, its consumer vehicle acquisition strategy is a proven approach. One company that seems to understand this is Carvana – a relative newbie player in the space, but one that is now embracing the importance of a consumer vehicle acquisition strategy. With Carvana’s advertising push to buy your car – no trade attached, the automotive darling startup has once again staked its claim against the traditional dealership experience. “We don’t play dealership games” is the mantra. And while the company is still not profitable, pivots like this do garner attention. And who best to look to other than Carmax. In contrast, Carmax sold more than 770k vehicles in 2018. And it profits about $200M each quarter according to a 2018 Q3 press release. The nearly 30 year old company buys EVERYTHING. And with more than 200 locations nationwide, one advantage Carmax has over all others is its wholesale platform. While there is truth to the idea that doing business with dealers is considered worse than a root canal, it doesn’t have to be this way. Carvana seeks to set itself apart from the traditional dealer, however, as we can see, it is clearly interested in adopting business strategies that savvy dealers (such as Carmax) have down to a science. 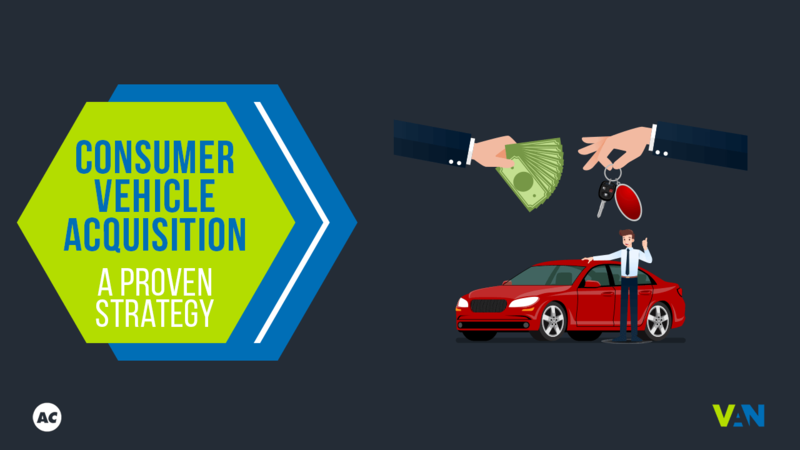 While you might not be able to compete with Carmax and Carvana on their wholesale platform, you can compete with them the customer experience. There is nothing keeping you from being an advocate for the seller and giving consumers a great experience. You can digitize the process, give a fair market quote, offer to pick up their vehicle, etc. When you see a “disruptor” adopting traditional methods, it says a lot about those traditional methods. But acquiring used vehicles from private sellers isn’t necessarily traditional. Vehicle trades and auctions are, but not consumer vehicle acquisitions. Ryan is a marketing consultant for Vehicle Acquisition Network who has been working in the automotive business since 2001. He got his start working with dealers in online merchandising and was one of the first to introduce blogging for car dealers. Today Ryan produces content for his Automotive B2B clients.